The Cookery Club is a ‘Lifelong Learning Centre’, licensed by the National Organization for the Certification of Qualifications and Vocational Guidance (EOPPEP) of the Greek Ministry of Education (Government Gazette 2677-Β/9-11-2011 and License No. 2100469). The Cookery Club is a certified centre organizing certification exams in Greek. 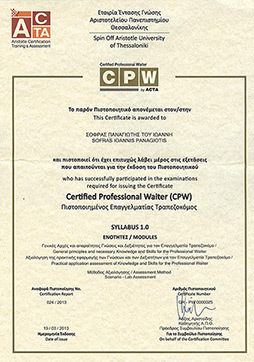 The Program Certification entity is ACTA, Spin Off Aristotle University of Thessaloniki, an intensive knowledge-oblast-off company, founded by the Aristotle University of Thessaloniki and offers the widest range of Human Resource Certification in the Greek market. Its objective is to offer the Greek citizens reliable Human Resources Certifications. Our Chef’s have obtained personal accreditation as instructors from the Greek department of Working Experience. Designed for entry level cooks who have the fundamental knowledge on each field: Cooking | Pastry or Service. The main goal of each certification is the professional support and further development for each profession examined with qualitative and objective conditions. The requirements determinate the candidate’s technical & theoretical experience. - Valid proof of his professional knowledge. Each certification concerns the degree of experience in which every participant will be tested. It is not mandatory to attend one of our training programs, however, these (intensive, advanced) cover the cognitive & technical part of the cooking / pastry art under consideration. Additional pieces of certification relating to food safety and hygiene (with your registration you will receive from Hygiene of Food Safety Manual Workplace Issues), as well as administrative and general food issues . This certification is aimed to anyone who want to start his career in the Culinary Art/ Pastry Art or Cooking Personnel, covering all necessary knowledge and practical skills. In addition, with this program professionals with experience, but without degree may certify their knowledge acquired over the years in the field. The candidate is required to answer 10 open questions. The duration is 60 minutes. Success rate 70%. There are no prerequisites for participating in the exams. Students of all ages and levels of education can enroll.